The entire trail at a glance and more durable and useful than any other resource available ! 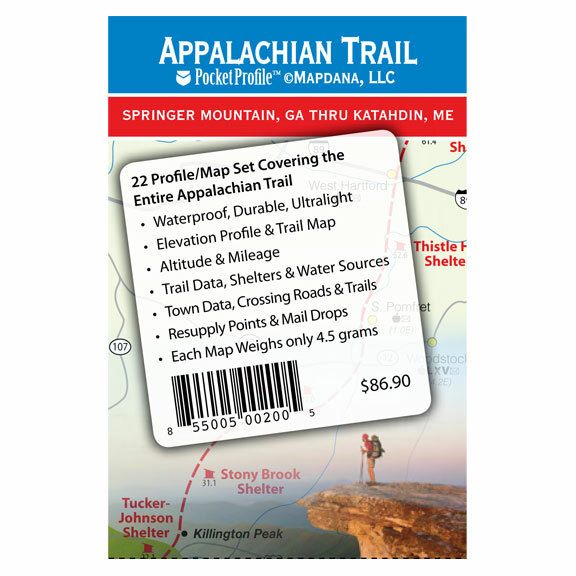 Weighing in at just 4 grams each, this information filled 22 map set features an Appalachian Trail map on one side and elevation profile with altitudes and trail data and information on the other. Trail data information includes trail mileage, shelter locations, camp sites, water sources, resupply points, lodging, outfitters, and post offices. This complete set covers the entire Appalachian Trail from Springer Mtn, GA to Katahdin, ME.